Ah quotes, those lines much beloved of the Blogger as a source of inspiration when the thought process dries up! I have to say that quotes don’t inspire me as such, they make me think, make me wonder what frame of mind the person was in when they said it and sometimes, did they actually say that or was it some clever script writer putting words in their mouth. We so often hear a quote or read a piece of writing that “shakes our world” (I promise to keep the quotation marks to a minimum). “Look to your children for inspiration, look at how they live, how they think and apply it to your ideas, you will find that within you there is a child with a plan” said the woman who had mortgaged her house to try to develop a piece of plastic that would no doubt end up on the back seat of the car beside the McDonald’s fries! Laura put down the dish she had been trying to scrub the burnt baked beans from and walked through to the living room. There slumped in front of the TV were her three inspirations! Her youngest slopped on the floor surrounded by two yoghurt pots, three teaspoons and a smashed packet of Monster Munch, her second in line to throne fast asleep on the couch with some unintelligible band screaming through headphones and there on the armchair her first-born, remote in hand flicking through the channels to find the repeat of the music show he had watched six times already. Laura stood there in the doorway watching them trying to find the one little glimmer of inspiration that may just turn her day into a bright new future for them all. Her mind drifted off into a brand new life, a cosy home office from which she would emerge to take the home-made muffins out the oven in time for the kids coming home from school, the huge corporate decisions made over a power lunch of home-made pasta in her Nigella like kitchen. Laura sighed and ducked as the empty yoghurt pot her youngest had aimed at her eldest missed her by a hair’s width. Back to the dishes! When Laura told me this story I jokingly asked her if she had found any inspiration. She laughed and told me that she had tripped over a holiday brochure on her way back to the kitchen. She and her husband had left the kids at her Mums and gone off for a weekend. So I guess inspiration and perhaps motivation does come in the strangest places or from the weirdest of sources. 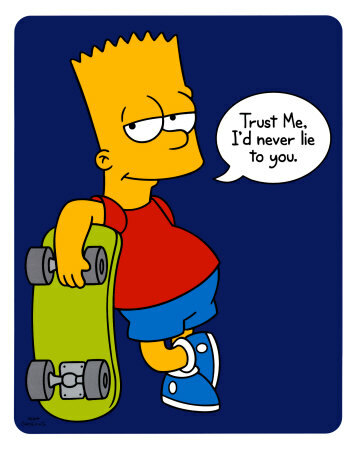 Today both mine and Laura’s comes from Bart! Previous A new muscle !